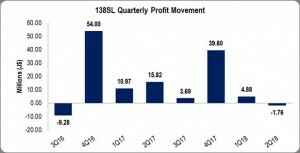 138SL’s Income increased by 65% to $411.92 million relative to the $248.96 million recorded for the corresponding six months period the prior year. Other operating income also increased for the six months period, growing 17% to 15.87 million relative to $13.52 a year earlier. Revenue for the second quarter rose 56% to $220.27 million (2017: $140.91 million), while other operating income climbed 33% to $8.61 million (2017: $6.47 million). Administrative expenses increased by 77% to amount to$203.42 million (2017: $115.27 million). Operating profit amounted to $224.36 million, an increase of 52% compared to $147.25million that was reported for the comparative period the year prior. The company also reported finance cost of $228.46 million (2017: $138.96 million) a 64% increase year on year. Losses before taxation for the six months period amounted to $4.10 million compared with the profit of $8.30 million for similar period last year. Following tax credits of $7.22 million (2017 tax credit: 18.49 million), net profit totalled $3.12 million, compared to a profit of $26.79 million recorded in 2017. This represented a dip of 88% in net profit. Net loss for the second quarter amounted to $1.76 million relative to a net profit of $15.82 million. Earnings per share (EPS) for the period amounted to $0.008 relative to earnings per share of $0.065 a year earlier. The loss per share for the quarter totalled $0.004 in contrast to an EPS of $0.038. The twelve month trailing EPS $0.11 the amount of shares used in this calculation was 414,500,000. Total comprehensive income amounted to $3.12 million. As of May 30, 2018 the stock traded at $5.09. As at March 31, 2017, total assets increased by 20% to $8.08 billion. This increase was primarily driven by a 65% increase in financial asset-service concession to $7.26 billion (2017: $4.39 million). Shareholders’ equity totalled $2.73 billion (2017: $2.11 billion) which resulted in a book value per share of $6.59 (2017: $5.04).